There is nothing more frustrating than getting caught in the rain and being ill-equipped. One minute you’re riding along enjoying the fresh air, the next you’re caught in a downpour. Having at least a rain jacket available is important, and looking good while wearing it is an added bonus. This is where the new REV’IT! 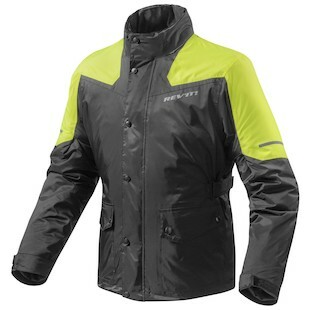 Nitric 2, Quartz, and Women’s Topaz H2O jackets come in. The REV’IT! Nitric 2 H2O Rain Jacket has been designed to look like a classic overcoat, which means it is perfect for wearing both on and off the bike during those rainy days. Looking to ride to dinner but want to stay dry? Look no further. The Nitric 2 will keep you dry and looking good. REV’IT! designed the Nitric 2 to make sure it fits comfortably over your existing jacket, so as long as your current gear is not excessively bulky you should be good to go. The REV'IT! Quartz H2O Rain Jacket is very similar to the Nitric 2, with the primarily differences in the styling. The Quartz comes with two chest pockets which is convenient for extra storage. The Quartz has an overall more fashionable look than the Nitric 2, which is perfect for you urban riders who want to look good. While the above jackets are recommended for men, REV’IT! didn’t overlook the lady riders. The new REV'IT! 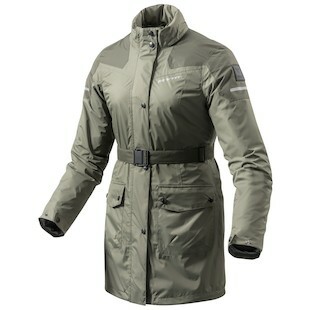 Women’s Topaz H2O Rain Jacket is REV’IT!’s answer for a stylish female-oriented jacket. 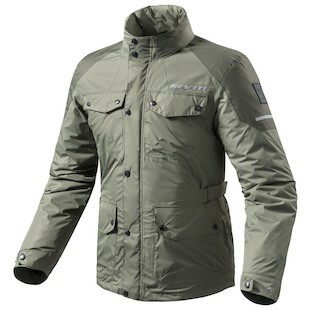 The Topaz’s parka styling makes it longer than the other jackets, which will provide more coverage in a heavy downpour. Like the other jackets, the Topaz has a storable hood and stash pockets at the front. Don’t let the rain stop you from riding, and from looking good while doing it. Classic and casual, the new H2O jackets from REV’IT! are a must-have for all of you urban riders who won't let rain stop you from having fun.